Thread: Do all schools of Hinduism believe in temporary hell? I'm new to the forum and I was curious on the Hindu belief in Hell. I was researching the Hindu version of hell (Naraka) on Wikipedia. And from everything I’ve seen, the teaching is that hell is temporary and one will be released from it when they have done their just punishment over time. In a few texts, hell is described as a bottomless pit of darkness where souls are trapped for eternity and deprived of rebirth. I was wondering what those texts were that said that, and if those texts held any weight? They seem to be a complete contradiction of what orthodox Hinduism believes. That is literally the only time I’ve ever heard of Hinduism believing in an eternal hell, and the source for it isn’t even cited on the Wikipedia. I was wondering if anyone could clarify this. Are these texts something to be worried about? Re: Do all schools of Hinduism believe in temporary hell? The word hell and the eternal hell belongs to Christianity, may be to all Abrahamic religions, I don’t know. If you call something eternal you can subpress people more easy. Hinduism calls it naraka or nether worlds similar to Greek mythology who called it Hades. In Hinduism all is a cycle, nothing is for ever – not the hell and not the heaven. We go through these realms (lokas) as long as we need to learn the lessons of our life, as long as we need to finish our karma, as long as we need to reach liberation thereof, moksha. And last but not least the fascinating story of Indra and the ants – even Indra’s position is not eternal. I wish to offer just a few ideas that I think are of value to the overall string. This heaven and hell (svargam loka and narakam loka) is talked about within our upaniṣads1 , within the śrīmad bhāgavad gītā2, and within the purāṇa’s3. All well and good, and one can read them as they see fit. My point here is to add just a bit more on what Indialover has mentioned above. Yes, I support this view of cycles – they are clearly laid out early on in the mahābhārata, and most know of these yuga-s ( ages); Yet when it comes to nothing is for ever, we need to look at this a bit closer. If one says no-thing is forever, yes this quite precise. No thing = no object (solid, liquid, gas, thought, feeling, idea, person, place, fauna or flora, etc.) is forever. Any thing that has a birth will have a death. Even thoughts/feelings have births. They come into awareness then leave/die. Yet on a bigger scale, whole galaxies and everything in them come into existence ( birth) then they too die with time. Yet all ‘this’ , all these occurrences happen within the field of Being. This Being never had a birth (ajāta) hence is deathless. It never had a beginning and therefore never has an end; hence it is eternal, forever. This is one thing to keep in mind. But how does it apply to the reader of this post? Let’s look to someone with authority to speak the words. So, this causes one some pause. Every day millions of cells are dying in me, I am young, then middle age then old and then I die. Well, that sure causes some consternation in one’s thinking of this verse (2.12). So, there must be something more to what kṛṣṇa-ji has offered arjuna. 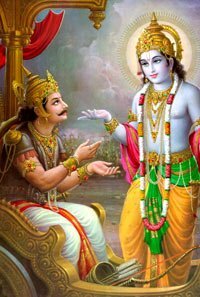 He tells this to arjuna early-on in the bhāgavad gītā the wisdom of the ages; it is through the rest of the bhāgavad gītā that kṛṣṇa-ji supplies the knowledge and insight to bring arjuna to this understanding. I will leave it to the reader to pursue this grand dialog between kṛṣṇa-ji & arjuna and then bring their questions to this forum as they see fit. Last edited by yajvan; 26 January 2018 at 10:21 AM. Thanks for precising what I wrote, Yajvan. Sure am I aware of the one eternal being. For me the concept of ‚hell‘ and ‚heaven‘ belongs to mythology resp. to the human mind to denote good and bad deeds and what will follow. At the end we fashion our hell and our heaven by our own on this earth. Anyhow the word ‚hell‘ does not correspond to ‚naraka‘. It’s just the dominance of Christianity that let non-Christian languages adopt this ugly word. Hell, satan/devil, sin have no equivalent in the Veda in the sense of the crude meaning in Christianity. Hell should be naraka or netherworld; satan/devil should be demon, rakshasa or one of the many other terms Indian mythology has; sin should be papa. Punya is unknown to Christianity. This religion works only with sin, satan and hell. Paradise is closed since long! When Europeans = Christians started translating Vedic texts into their languages they took their terminology according their conviction = Christianity. And Indians, ‚occupied‘ by English language took them over, without thinking what they take over. Thus the transaltions of Vedic texts are full of Christian terminology. That throws a complete wrong light on the greatness and benevolence of Vedic thoughts. "Lomasa said, The lotus-eyed king did all that exactly in the way prescribed to him. And when his sins were worked off, he was set free together with the priest. O king! Fond of the priest as he was, he won all those blessings to which he had entitled himself by his meritorious acts and shared everything with the family priest. This is his hermitage which looketh lovely before our eyes. Any one would attain the blessed regions, if he should spend six nights here controlling his passions. O king of kings! O leader of the tribe of Kurus! Here, free from excitement and self-controlled, we must spend six nights. Be thou ready therefor.'" It’s just the dominance of Christianity that let non-Christian languages adopt this ugly word. To make matters worse, Christianity stole it from ancient Norse religion. The goddess and her realm are called Hel. It is not a place of punishment, but a place where ordinary people (i.e. not heroes) go after death. Hel (or Hela) is not an evil goddess... just cold, detached and impartial. Her realm is described either as gloomy (like in ancient Greek religion) or just as ordinary as our world, but with none of the cares and evils. It's not permanent either. After the Norse pralaya (Ragnarök) plays out and the world's cycle renews, life begins over again, and Hel releases the souls. Is hell eternal in hinduism ? Who when to hell and back in Hinduism to warn about it?